Birthplace: North Omaha, Nebraska, U.S.
Malcolm X was a minister and human rights activist. He is widely considered to be one of the most influential African Americans in history. Malcolm was a member of the Nation of Islam for almost 20 years. He supported racial segregation and Black supremacy. In 1964, after going on a pilgrimage he decided to leave the Nation of Islam due to disagreeing with their beliefs and values. 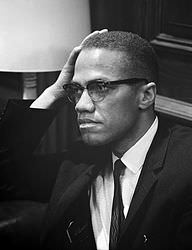 In 1965, Malcolm was assassinated by members of the Nation of Islam. “The Autobiography of Malcolm X” was published in 1965 and became one of the most important nonfiction books in history. Malcolm Little was born in Omaha, Nebraska. He took the pseudonym “Malcolm X” after joining the Nation of Islam. He was married to Betty Shabazz and they had 6 children. He was 39 years old when he was killed. Malcolm X was a famous American civil rights activist, who was born on May 19, 1925. As a person born on this date, Malcolm X is listed in our database as the 1st most popular celebrity for the day (May 19) and the 3rd most popular for the year (1925). People born on May 19 fall under the Zodiac sign of Taurus, the Bull. Malcolm X is the 18th most popular Taurus. Aside from information specific to Malcolm X's birthday, Malcolm X is the 107th most famous American. In general, Malcolm X ranks as the 172nd most popular famous person, and the 2nd most popular activist / civil rights leader of all time. “The Famous Birthdays” catalogs over 25,000 famous people, everyone from actors to singers to scientists to serial killers and more. If you're curious to see who was born on your birthday, you can use our database to find out who, what, where, when and why. You can search by birthday, birthplace, claim to fame or any other information by typing in the search box, or simply browse our site by selecting the month, the day, the horoscope, or any other clickable option.